Lasallian Mission Services is thrilled to announce the following candidates recently appointed as Lasallian Volunteers (formerly Share the Mission) for 2018. Matthew Apuda will be volunteering at La Salle College, Middle Swan in Western Australia. He graduated from De La Salle College, Mangere East, New Zealand in 2015. Since 2016 he has been studying for a Bachelor of Computer and Information Science. Pearl Bartlett has been appointed as a volunteer at La Salle College, Middle Swan, Western Australia. Since 2016 she has been a Volunteer Youth Minister at St Cassian's Centre, Kintbury in England. Franco De Joya has been placed at De La Salle College, Mangere East, New Zealand. He graduated from Oakhill College, New South Wales in 2017. Hamish Dykstra will be volunteering at La Salle Technical College, Hohola, Papua New Guinea. He is a 2017 graduate of John Paul College, Rotorua, New Zealand. Rodwill Joe has been placed at La Salle College, Middle Swan, Western Australia. He graduated from La Salle Technical College, Hohola, Papua New Guinea in 2016. He has been studying National Certificate 2 in Automotive during 2017. In 2018, Scott Lealaisalanoa will be volunteering at yourtown St. Mary's and the Bankstown Community in New South Wales. He graduated from De La Salle College, Mangere East in 2015. Scott was previously a Share the Mission Volunteer throughout 2017 at La Salle Technical College, Hohola, PNG and at Luurnpa Catholic School, Balgo in Western Australia in 2016. Matthew Murrie was a Share the Mission volunteer at La Salle Technical College, Hohola, Papua New Guinea in 2017 and will be returning to volunteer again in 2018. Matt graduated from Oakhill College in 2016. Jackson Stafford has been appointed as a volunteer at yourtown St. Mary's and Bankstown Community in Sydney. He graduated from St. Bede's College, Victoria in 2017. Lachlan Stewart will be volunteering at De La Salle College, Mangere East, New Zealand. He graduated in 2017 from Southern Cross Catholic College, Scarborough, Queensland. Cameron Streeter will be volunteering at La Salle Technical College, Hohola, Papua New Guinea. He is a 2017 graduate of Oakhill College, New South Wales. These volunteers were outstanding in their applications and interviews, they all impressed the interview panel with their well-considered answers and maturity. 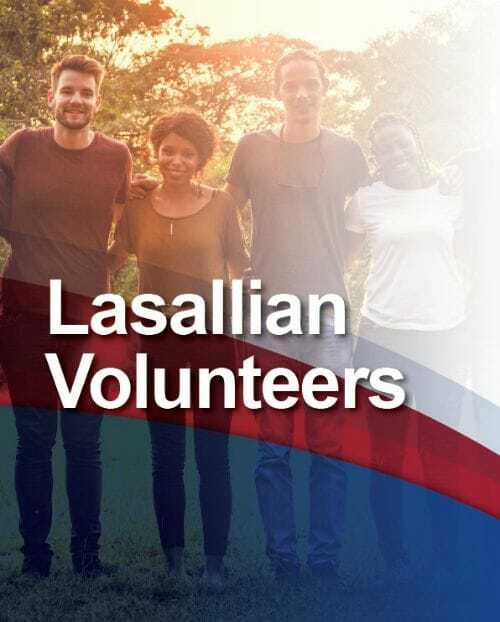 I am truly excited to be working with these Lasallian Volunteers as they embark on a year of service in 2018.